Three teenagers have been found guilty of murdering a man who was kicked to death outside his home in Cheshire. Garry Newlove, 47, died two days after being "kicked like a football" when he confronted a gang in Warrington in August 2007, Chester Crown Court heard. One killer, Adam Swellings, was only released from custody on the day of the attack, with one of his bail conditions being that he did not go to Warrington. Two other teenagers were cleared by the jury after ten days of deliberations. 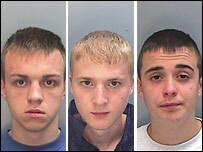 Swellings, 19, of Meredith Street, Crewe, Stephen Sorton, 17 of Honister Avenue, Warrington, and Jordan Cunliffe, 16, have been convicted of the sales manager's murder. Speaking at a news confrence after the verdicts, Mr Newlove's widow, Helen, said: "I am completely heartbroken. I can honestly say, if it were not for my three girls I would not want to live without my soulmate." She revealed the couple's daughter Amy suffered flashbacks since witnessing her father being kicked and punched to death. There needs to be a clamp down on unrulyness and proper guidance and boundaries in place to avoid incidents like this happening. The 44-year-old added: "The light has gone out of our lives - it's like a piece of jigsaw has been lost forever. The tiniest of things we used to do as a family feels like it takes forever to achieve them. We all sit at home, the girls and I and wait for Garry to walk through the door." Mrs Newlove said her husband's death was harder to accept because he had successfully battled stomach cancer 15 years ago. Mr Newlove was attacked by the teenagers on 10 August outside his home on Station Road North, Fearnhead. 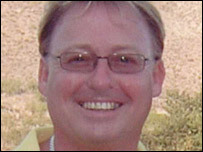 He was left unconscious with fatal injuries from which he died in hospital two days later. A 15-year-old and a 17-year-old were cleared of murder and manslaughter. The jury deliberated for 55 hours 25 minutes in total. On the night Mr Newlove was fatally attacked he had walked out of his home to speak to a gang of youths who he believed had been vandalising his wife Helen's car. His youngest daughter Amy, 12, watched her father being kicked to death by the killers, who have been on trial for six weeks. The court heard that Mrs Newlove, 44, and the couple's three daughters, Zoe, 18, Danielle, 15 and Amy, held a vigil at his bedside in Warrington Hospital, but Mr Newlove had suffered a massive brain haemorrhage during the attack. During the trial Swellings admitted throwing the first punch at Mr Newlove and originally pleaded guilty to manslaughter but that plea was rejected by the prosecution. A trainer belonging to the 17-year-old who was convicted was found lodged under Mr Newlove as he lay dying on the pavement. The teenager admitted to his mother he had been involved in an incident in which a man was beaten up, and she called the police, who then arrested him. Swellings, who was arrested at his father's home in Crewe, told police, who came to arrest him, he had been watching the news and knew why they were there. When Mrs Newlove gave evidence she spoke of her horror of seeing a trainer print on her husband's head in the aftermath of the attack. In her statement, read out when the trial began on 13 November, Mrs Newlove recalled how in the months prior to his death, her husband had been increasingly concerned about anti-social behaviour in the area. The family car had been vandalised on four occasions and Mr Newlove had even stopped his children walking to the local shops after dark because he feared what would happen to them. Mr Newlove and his family had been supposed to go on a holiday to Lanzarote the day after he died. Ian Rushton of Cheshire Crown Prosecution Service, speaking outside court, called the killing by the trio "a callous crime". "They kicked and punched Mr Newlove to death, leaving his three daughters without a devoted dad and his wife without a loving husband. "We would like to thank those people who came forward who were prepared to give evidence, particularly Mr Newlove's daughters."